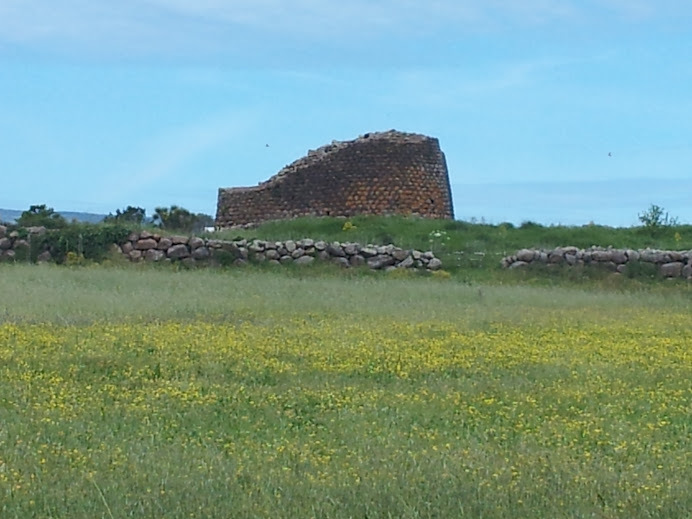 Another beautiful day for us to explore the countryside around Oristano. 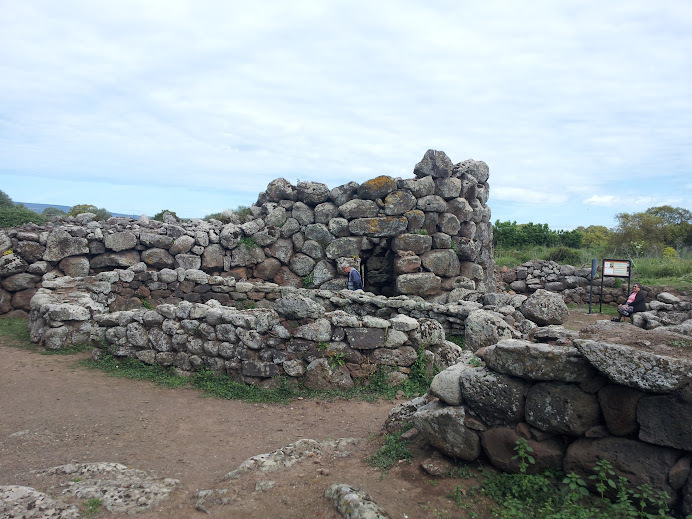 Our first destination for the day is the nuraghe at Losa located within sight of the main north-south highway on the island. 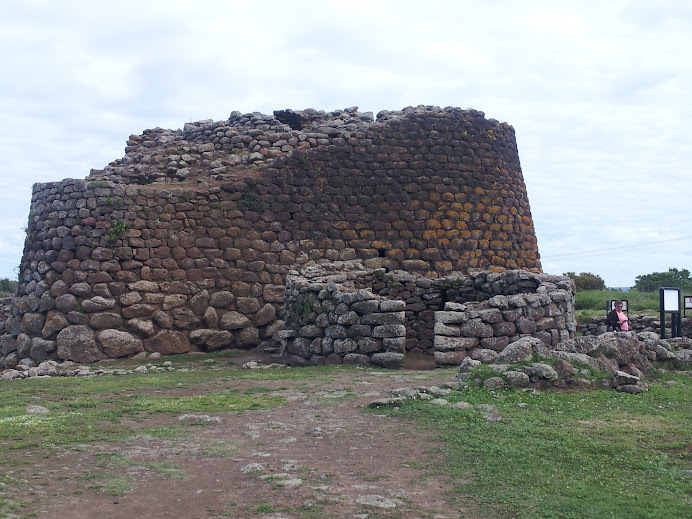 The remaining tower is over 40 feet high and dates from about 1300 BC...still very well preserved. 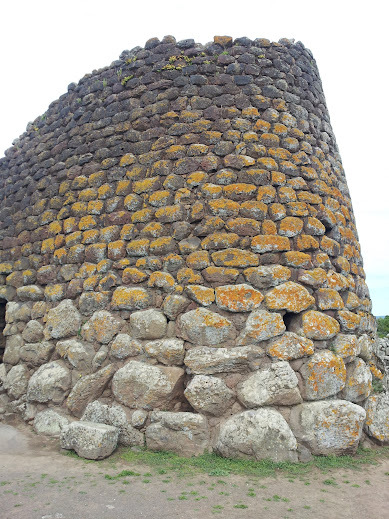 There are a number of outbuildings close by the tower and some newer Roman cinerary urns can be seen as well as the wall that defines the village's perimiter. Climbing to the top by a narrow spiral staircase, there is a good view over the site and out to plain beyond. and of course, the wildflowers are everywhere. 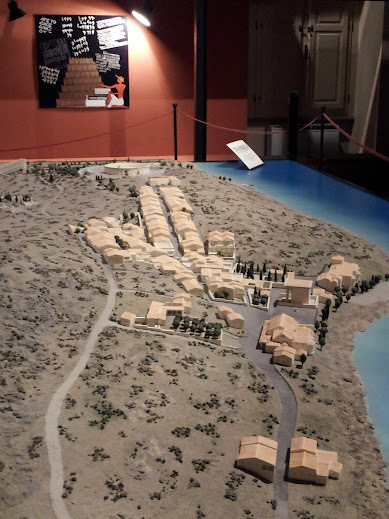 We then make a leap from the 2nd millennium BC to the 20th century when we visit the boyhood home of Antonio Gramsci, the Italian political theorist and founder of the Italian Communist party. He grew up in Ghilarzia and the Gramsci Foundation maintains the house as a library and shrine to him. We are given a tour of the Casa Gramsci by a very enthusiastic staff member who has an encyclopedic knowledge of Gramsci's life and thought. Antonio Gramsci (Italian pronunciation: [anˈtɔːnjo ˈɡramʃi]) (January 22, 1891 – April 27, 1937) was an Italian writer, politician, political philosopher, and linguist. He was a founding member and onetime leader of the Communist Party of Italy and was imprisoned by Benito Mussolini's Fascist regime. Gramsci was one of the most important Marxist thinkers in the 20th century, and his writings are heavily concerned with the analysis of culture and political leadership; he is notable as a highly original thinker within modern European thought. He is renowned for his concept of cultural hegemony as a means of maintaining the state in a capitalist society. We spend about an hour looking at bound copies of his newspapers, his letters from prison, photographs of family and associates, paintings of Gramsci and other memorabilia. Some of the rooms are furnished with the articles that he grew up with. We learn that he was less doctrinaire than many Communists of his time and was open to collaborating with Socialists and other liberals. Gramsci was arrested by the Fascists in 1926 even though he certainly had immunity as a member of Parliament. Our guide intimated that by the mid-1930s he was having doubts about the way the Soviet Union was carrying out the communist revolution and, if he had lived longer, would likely not have supported that type of State communism. In any case, the visit was both informative and moving...especially for nostalgic "lefties". hoping to find a bar or restaurant on the shore where we can have a light lunch. We drive for a while and there is nothing...not even houses. 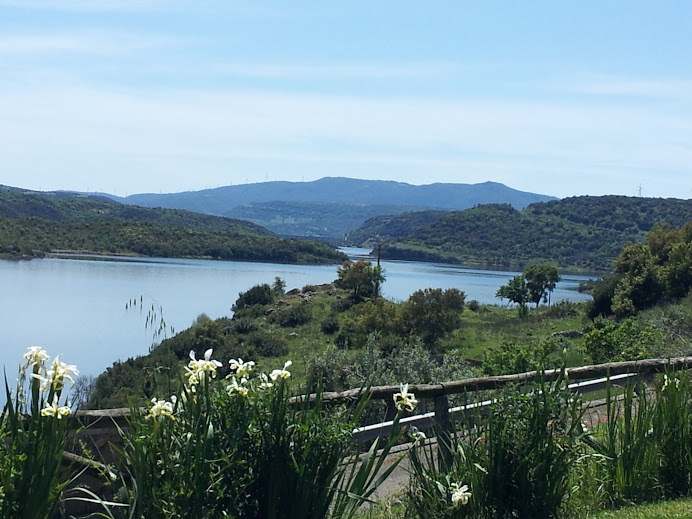 But as we pass a dam that creates the Diga Tirso (Tirso Reservoir) which is part of Lago Omedeo, we see a sign for the Trattoria Cantinedda. We pull into the parking lot and walk up to the seemingly closed building. There are two men sitting at a table and they tell us to go inside. 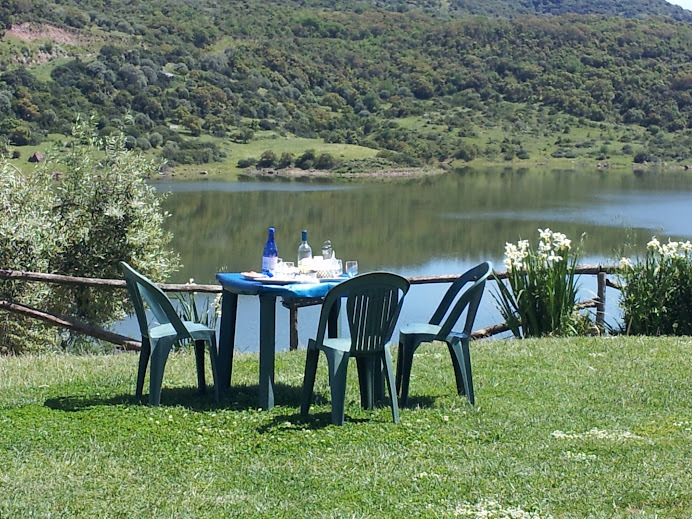 There is no one inside except a friendly women who says of course we can have lunch outside in the sun at a table on the grass overlooking the reservoir. So we have one of those fantasy Italian experiences...the restaurant that appears out of nowhere, good food (antipasto and insalata caprese, an engaging proprietor who speaks to us in Italian, local homemade pastas and some nice white wine) in the sun with a beautiful view....delicious. 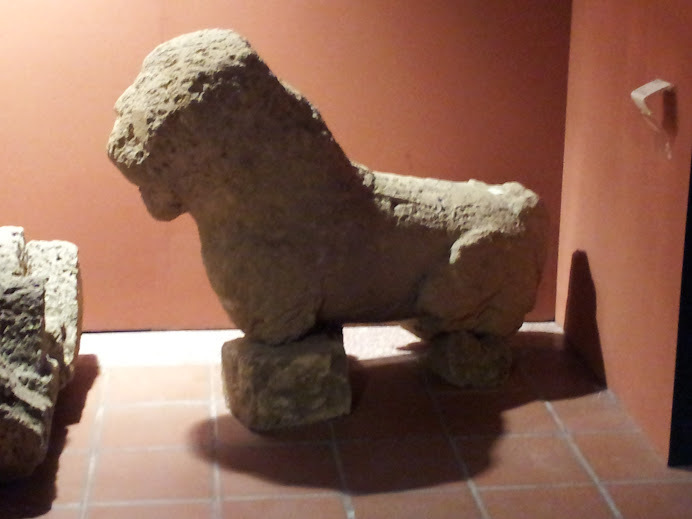 and we even find the lion from Tharros that we had been looking for the day before. Still full from our lunch, we find a shop that sells Sardinian crafts (they had a sign next to the museum) and Diana buys some souvenirs and gifts. We have a nice conversation with the proprietor and his friend (he is happy that the advertising sign next to the museum is working) about Sardinia and the economy. 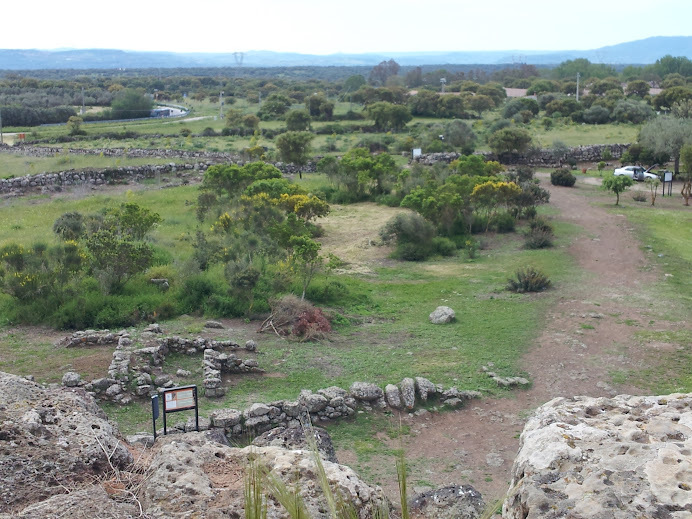 Tomorrow we are off to Alghero to spend the weekend with our friends from Rome.